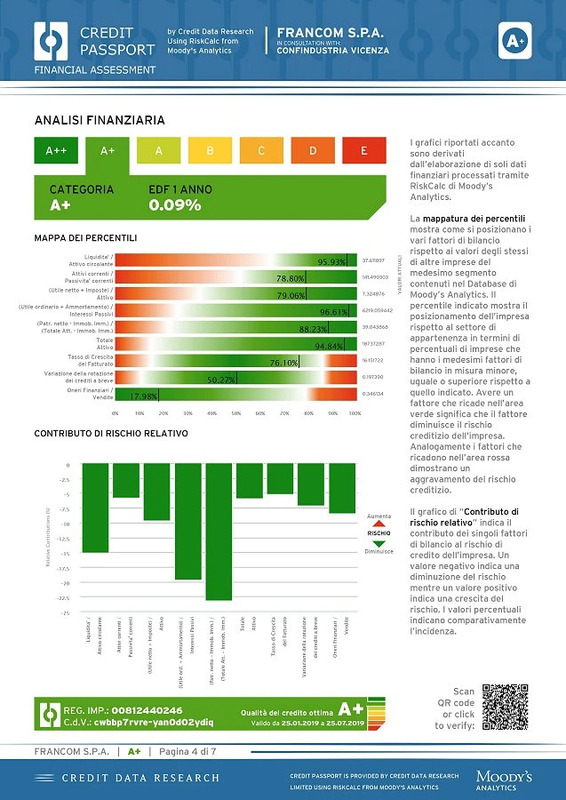 Francom S.p.A. will enjoy an excellent credit rating between February and July 2019 according to a study carried out by the London-based agency Credit Data Research on behalf of Confindustria Vicenza and Francom and based on the figures of our last financial report. 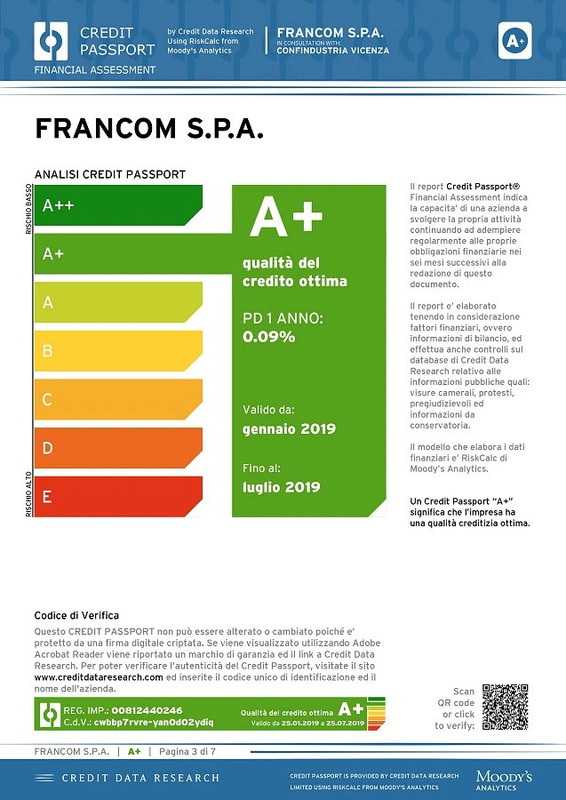 Francom has been awarded an A+ Credit Passport, representing almost the minimum level of credit risk available to companies. This confirms Francom’s ability to run its daily business and fulfil all its financial obligations over the six months following the report’s publication. A+ Credit Passport: what exactly does it mean? Francom offers an extremely low risk of default and, consequently, a very low risk of insolvency. As a result, Francom deserves a very high credit rating, meaning that banks, partners, customers and suppliers can have complete faith in our business. A “Credit Passport” represents the financial health of a company and facilitates access to export markets where credit worthiness is an important parameter in the selection of suppliers. “Credit Passports” are rated from E to A**, through D, C, B, A and A*. While E indicates critical credit quality, A** identifies an excellent rating. 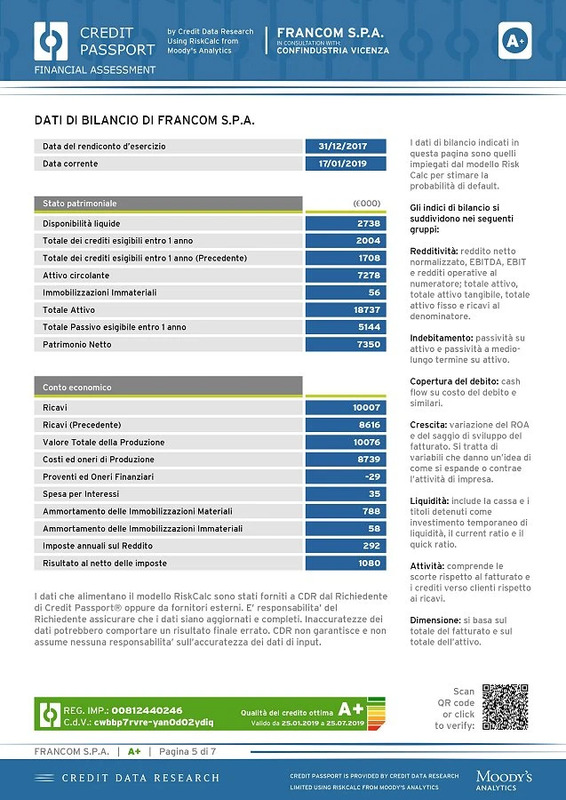 The rating awarded to Francom is based on our last balance sheet, from which the following are some of the key figures: liquid assets (2,738,000€), total receivables due within 1 year, active circulating assets, intangible assets, total assets (18,737,000 €), total liabilities payable within 1 year, net assets (7,350,000€). As far our income statement is concerned, the figures used to draw up the report include revenues (10,007,000€), value of production (10,076,000€), production costs and charges (8,739,000€), depreciation, annual corporation tax and profit net of tax (1,080,000€).